New Adventures return to Wimbledon with one of their most popular and beloved productions, Matthew Bourne’s Cinderella – a thrilling and evocative love story set in London during the Second World War. 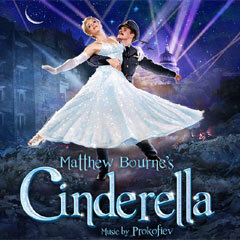 Cinderella enjoyed an 8-week sold-out season at Sadler’s Wells at Christmas. The week at New Wimbledon Theatre from 1 – 5 May 2018 will be your final chance to catch the show in London as part of its UK and International tour! With Lez Brotherston’s sumptuous Olivier Award-winning designs, lighting by Olivier Award-winning Neil Austin and video and projection designs by Duncan McLean, Cinderella will be performed in Surround Sound, designed by Paul Groothuis.